Nevsail loves to hear your reviews! Review us today to be in with a chance to win monthly prizes! Would just like to say that we went out as part of a group of 7 last Sunday to do Windsurfing,you also very kindly included Paddle Boarding and kayaking...Had a great time and really enjoyed the diversity..Thanks a mill and will definitely be recommending here.. Thanks to all the instructors at Nevsail Watersports for giving the Ennistymon cub scouts such a great day on Sunday, there's a few budding rock climbers in Cubs now. Highly recommend this company. The Rock Climbing at the Burren this Sat. morning was Amazing! Thanks Nevsail! We look forward to the next outing! See ye all at the Limerick Climbing Wall in Sexton Street on Wed. for more great climbing! Hi Dave & co, Just writing to say a massive Thank you to you and all the team @ nevsail for making the DCU class trip over the 2days so enjoyable! Here is a boy who, even after a winter of taking private swimming lessons to prepare for his summer in Kilkee, still didn't like to get his face wet, let alone put his head under water! Now he spends hours in the sea playing in the waves and riding them with his boogie board; looking for, and evenpicking up, marine life at the Pollock Holes; using seaweed as a toy; exploring the rocky ridge called Tucker; observing the changing tides, crashing waves, rock formations and wildlife around the cliffs; and in general enjoying a life near the sea. 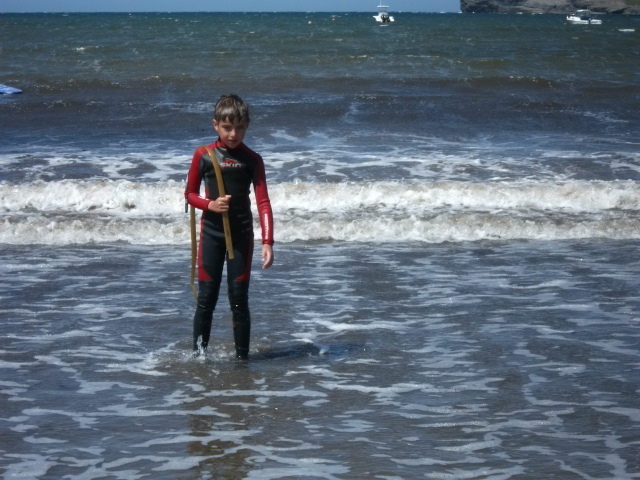 Now I am even hearing enthusiastic talk about his plans to surf one day... a prospect I am not as enthusiastic about! Much of the new Eoin, I credit to his time spent this summer at Nevsail Watersports Summer Camp . Thanks to Nevsail, Eoin is now willing to spend hours in the wild and cold Atlantic Ocean, both at the camp and on his own, afterwards. In the camp, he has had the opportunity to try his hand at such watersports as kayaking, canoeing, boogie boarding, snorkeling and more - and has even spent some time building a raft! The enthusiastic young instructors at the camp have been great about encouraging this shy, hesitant boy to try activities that he would never have attempted otherwise and their kindness and sensitivity have made him feel welcome and comfortable in the camp. Eoin's daily explorations around the bay of Kilkee and his experience within the camp, have made him, not only more confident and comfortable with the sea, but more confident in his own skin. This makes every minute I've spent squeezing him into, and prying him out of, his wetsuit - and then properly cleaning it after each use - well worth the effort! 30 of us went to Kilkee in July for my friends hen party- we had an absolute ball at Nevsail Watersports, the staff were great fun and made sure that everyone was enjoying themselves. We went kayaking around the bay, into some caves and then stopped off at a secluded cove for a picnic. Then some people did some surfing and those who didn't want to get wet had a leisurely sail in the yacht. When I had rang to book this originally, I hadn't organized dinner or accommodation- Dave at Nevsail Watersports was great and got us a deal at a local restaurant, seaweed baths and accommodation in a package deal for us-saved us a packet. Great night out in Kilkee too, some fraud and tons of live music. "My Kids had an amazing time at the water sports camp"
We went to kilkee for 2 weeks last July on holidays and we left the kids in for the morning camp which ran from Monday to Friday. They had an amazing time during the summer camp and done different activities every day. All of staff where really nice, enthusiastic and had so much energy. It was the first time the kids had been Surfing, sailing and Kayaking. We where a little nervous letting the kids do the water sports for the first time but after keeping an eye on them during the first morning it was very clear they where in safe hands. We are definitely going back to kilkee this year so the kids can join in the fun again on the summer camp. 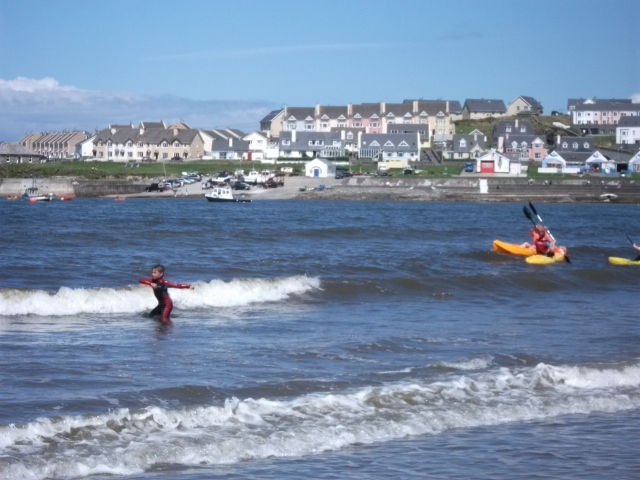 We stayed for a week in Kilkee and did a lot of windsurfing and surfing at Nevsail Watersports during the summer. We had very enjoyable day lessons for complete beginners, and despite being the world's worst surfer, I still had a lot of fun and definitely plan on trying it again in the future. I enjoyed every minute of it! Very good value for money, would definitely come back to the same place and take the surf classes! The staff were always super positive and enthusiastic and instructors were always helpful and gave you a lot of information about the beach and the nature of surf and instruction on the water was exceptional. I can now do so much more and learnt a heap. This year, first year students got the opportunity to participate in an activity day in Kilkee, Co. Clare as part of their end of year school tour. The trip was organised by the Year Head of First Year; Mr. Mike Daly. On Friday 18th May, over 80 students from all four 1st Year groups; Eithne, Nessan, Senan and Fidelma set off on the bus. The teachers accompanying students on the trip included Mr. Daly, Ms. Plant, Ms. Browne, Ms. Naughton and Ms. Creed. There was a feeling of excitement and nerves as students travelled on the bus to Tarbert where the bus waited to board the ferry which crosses the Shannon Estuary to Co. Clare. For some students this was their first time on a ferry and during the twenty minute crossing, students got to take in the stunning views from the top deck, whilst others took advantage of the tuck shop on lower deck, stocking up for the long day of activities ahead of them! As we arrived at Kilkee beach, we were greeted by the Nevsail Watersport Instructors who were going to be taking students for the day's activities. The activities consisted of both land and water based activities including; Abseiling, Orienteering, Archery, Team games/challenges, Kayaking, Canoeing, Raft-Building and Windsurfing. Students were given all of the appropriate gear for each of the activities including wetsuits, harnesses, and helmets. Students were excited to try new activities and sports which they would not previously have tried or participated in. Overall, students involvement in team challenges and team games helped form new friendships, strengthen bonds within the group and created a real positive and fun atmosphere within the First Year class groups. By lunchtime students were wet, sandy, tired and hungry so students were allowed time to change and grab a bite to eat. As a treat on the way home students got to stop in Kilrush to get some lunch or to do a bit of souvenir shopping. With sticks of rocks and bags of goodies students once again boarded the ferry for the journey home. Whilst on the way home, teachers were treated to a sing song by students, with a chorus of 'Amhrán na bhFiann' which seemed an appropriate song to mark the end of a fun filled day.